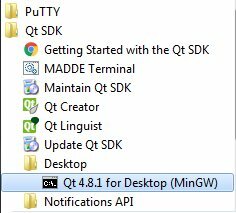 The QtCreator and QtSDK make it pretty easy to localize your application. Here is a short description of how to translate the TextEditor app to different languages. The first step in the translation process is to mark the text strings that we want to translate in our source code. In the QML files you just need to pass the text strings to the qsTr function as shown in the following example. In this case we must use the QT_TRANSLATE_NOOP macro to pass in the context (“TextEditor”). After we have marked all the translatable strings in the QML and C++ files we need to collect the strings for the translation stage. This is done with the lupdate tool. First open the QtSDK command prompt from the Windows start menu. The lupdate command will go through all the source files starting from the project main folder (../..). It will collect all the strings that we marked previously and create a British English translation file (tr_en.ts) into the i18n folder. For each translatable text string the file shows the string location (filename and line number). The <source> tag shows the string to be translated. After the translation each new language will have a separate file (e.g. tr_de.ts for the german translation) where the translated text strings will be stored. The translated string will be marked with the <translation> tag. 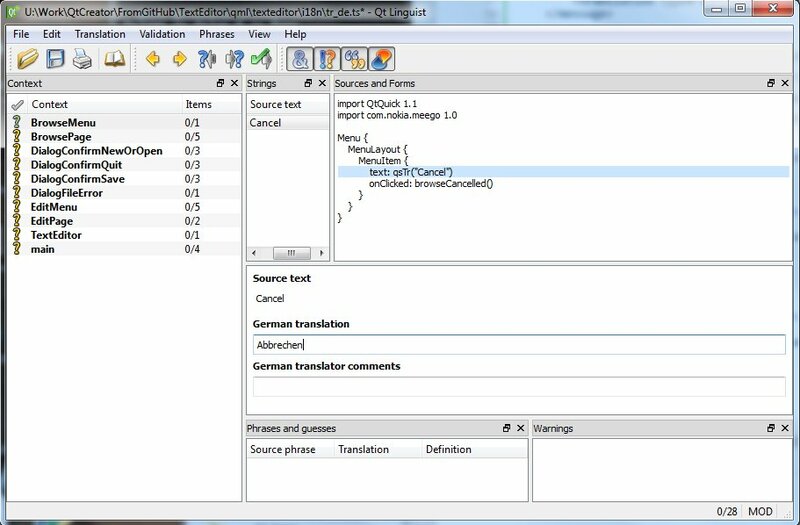 The Qt Linguist tool should be available as part of the QtSDK package. It provides a nice graphical interface for translating the application text strings. Let’s assume we can translate from english to the german language. Start Qt Linguist from the windows Start menu and load the tr_en.ts file. First select Edit>Translation File Settings… and set the target language to German, Then save the file (File>Save As…) to i18n/tr_de.ts. We are ready to start. The context pane on the left hand side shows all the files that the lupdate command found containing translatable strings. The numbers following the file name show the number of translated strings and the number of strings available for translation in that particular file. On the right hand side is the source code with the current source string highlighted. Below the source code is the translation pane where we can enter the translation. We can then click the green check mark in the tool bar to accept the translated source text and to move on to the next string. For each source file (*.ts) a runtime file (*.qm) will be created. To use the translations in the application we will need to create a resource file (let’s call it translations.qrc) and load all the .qm files from the i18n folder to the resource. Add an alias for each .qm file (e.g. tr_de for qml/texteditor/i18n/tr_de.qm) for easier access from the source code. Next we will modify the main.cpp file and activate the translations. The QTranslator header is needed. To load the correct language file we will just query the system locale and use the locale string to create the language file name (assuming here that the locale string has been used when naming the translation files). Then we will instantiate the QTranslator class, load the language and install the translator. In case the loading fails (e.g. because we don’t have a translation available) we will fall back to the english version. 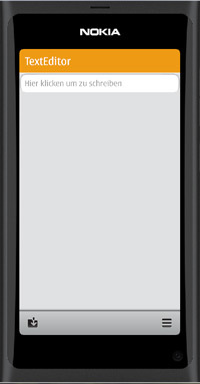 // to the current setting of the device is not available.